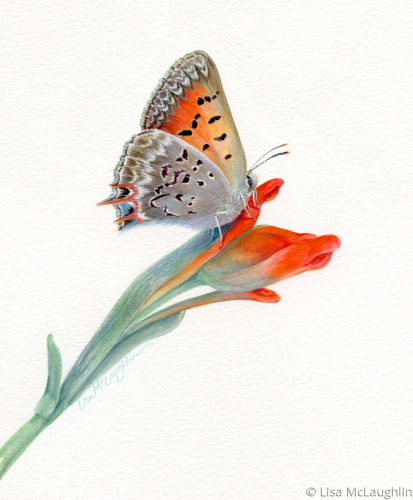 Tailed Copper Butterfly rests on a Woolly Indian Paintbrush wildflower bud. original available for purchase, please contact. 6" x 5"12" x 10"18.25" x 15"24.25" x 20"30.25" x 25"34.75" x 28.75"
Beautifully blended colors bring this highly detailed painting to life. Rich and brilliant shades of tangerine and terra cotta. 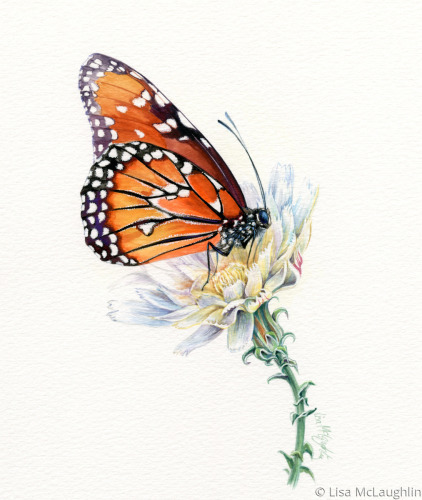 5" x 6.75"9" x 12"13" x 17.25"17" x 22.75"21" x 28"24" x 32"
Queen Butterfly sips nectar from a delicate white field flower. 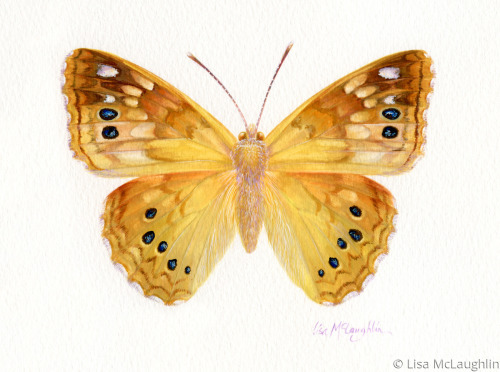 McLaughlin watercolor original has been sold. 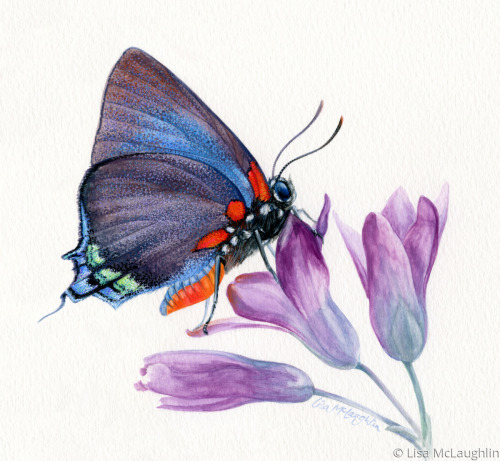 6" x 5"11.75" x 10"17.75" x 15"23.75" x 20"29.5" x 25"35" x 29.5"
Great Purple Hairstreak Butterfly rests on purple wildflowers. McLaughlin watercolor original available for purchase, please contact. 5" x 5.5"10" x 10.75"15" x 16.25"20" x 21.75"25" x 27"30" x 32.5"
with a decidedly contemporary look and feel. Sleek iridescent black wings with purple highlights. Light reflection surrounds yellow spots. life-sized, is available for purchase, please contact. 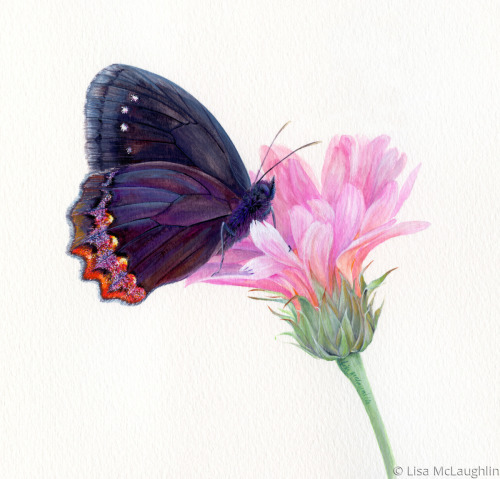 5" x 6.5"8" x 10.5"11" x 14.5"14" x 18.5"17" x 22.25"21.75" x 28.5"
Rich shades of deep plum reflected upon the wings of this beautiful butterfly perched on a pink wildflower. Red highlights shimmer. 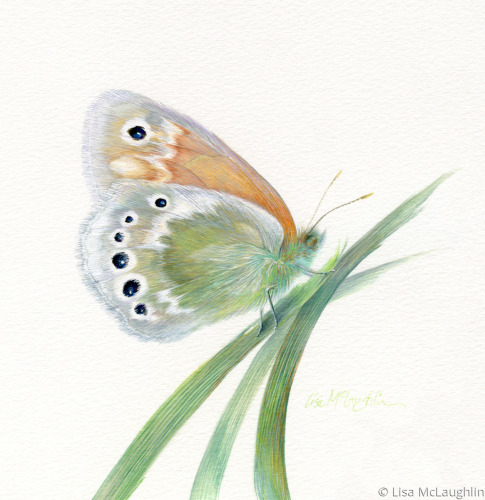 5" x 5.25"10" x 10.5"15" x 15.75"20" x 21"25" x 26"31.5" x 33"
American Ringlet Butterfly rests on prairie grass. 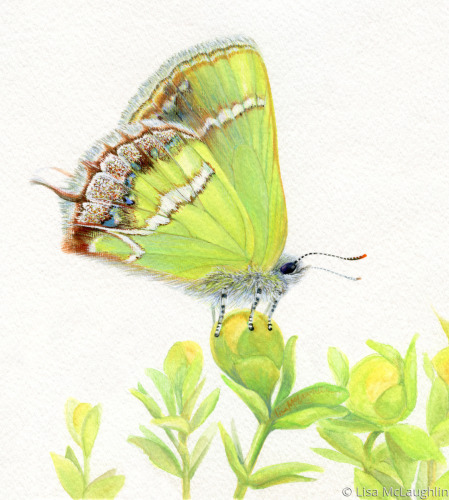 Soft shades of green with lots of delicate detail and fine brushwork. available for purchase, please contact. 5.25" x 5"11.25" x 11"17.5" x 17"23.75" x 23"29.75" x 29"33.75" x 32.75"
5" x 5.75"9" x 10.25"13" x 15"17" x 19.5"21" x 24.25"27.25" x 31.25"
This popular bright orange Florida Butterfly comes to life in a very detailed original watercolor painting. Rich warm hues of tangerine. McLaughlin watercolor original available for purchase, please contact. 5" x 6.75"9" x 12"13" x 17.25"17" x 22.5"21" x 28"24" x 31.75"
original is available for purchase, please contact. 5.5" x 5"11" x 10"16.75" x 15"22.25" x 20"27.75" x 25"33.75" x 30.25"
Super bright and cheerful, Silver-banded Hairstreak Butterfly rests on creosote buds. 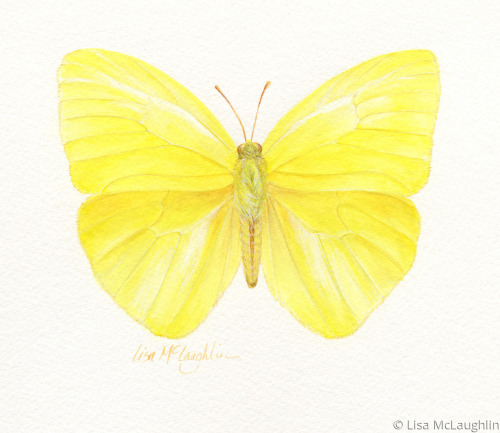 Lime green, colorful McLaughlin watercolor original available for purchase, please contact. 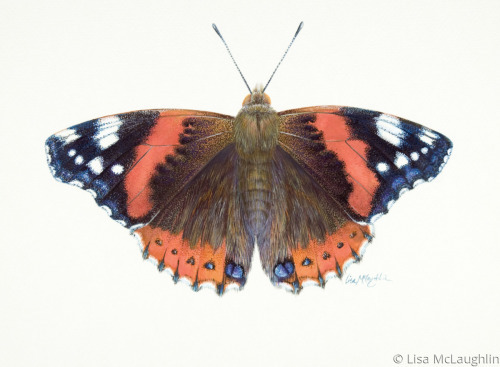 5.5" x 5"11.25" x 10"16.75" x 15"22.25" x 20"27.75" x 25"31.5" x 28.25"
Red Admiral Butterfly. Classic red stripes on wings. Vibrant reflected color. 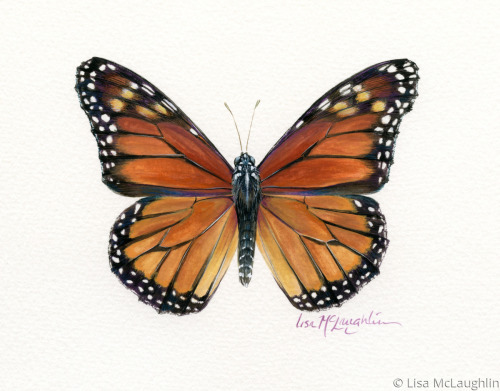 5" x 6.75"8" x 11"11" x 15"14" x 19"17" x 23.25"22.25" x 30.5"
Very realistic painting of that classic beauty, the ever popular Monarch Butterfly. Beautiful and accurate color and detail. Lots of life and reflected light in the wings. McLaughlin watercolor original available for purchase, please contact. 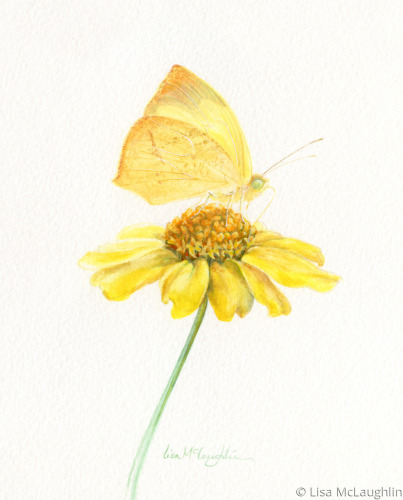 5" x 6.5"9" x 11.5"13" x 16.5"17" x 21.75"21" x 26.75"23.5" x 30"
Lemon yellow field butterfly sips nectar from a bright yellow flower. 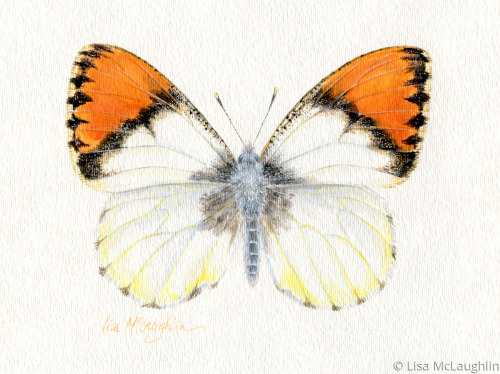 6.25" x 5"11.25" x 9"16.25" x 13"21" x 17"26" x 21"29.5" x 23.75"
A simple and elegant portrayal of a common field butterfly. 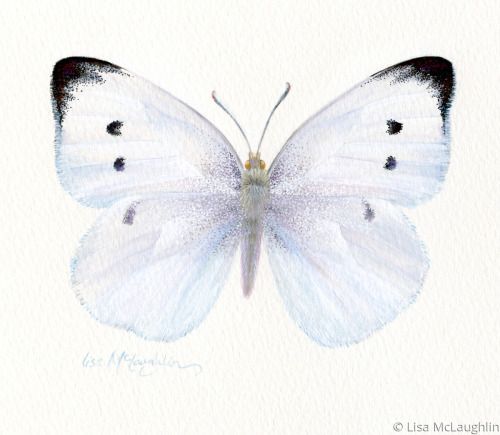 Pearl white wings with black wing tips and dots. 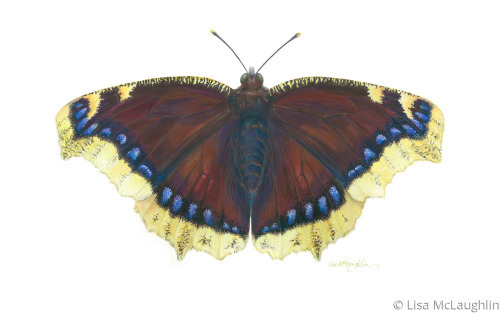 5" x 5.75"9" x 10.25"13" x 15"17" x 19.5"21" x 24.25"24.5" x 28"
The Mourning Cloak is the first butterfly to be seen in spring. Wings of rich chocolate brown with butter yellow and blue accents. 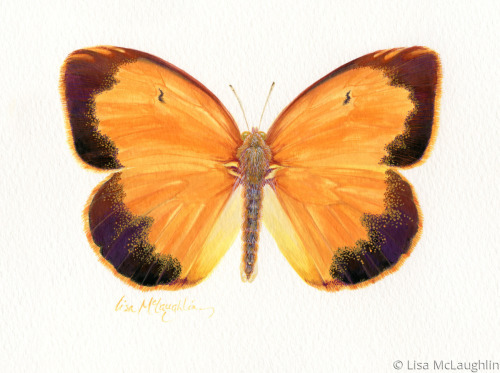 5" x 5.75"7" x 8"9" x 10.5"11" x 12.75"13" x 15"
Subtle golden maize shades of the southwest grace the wings. 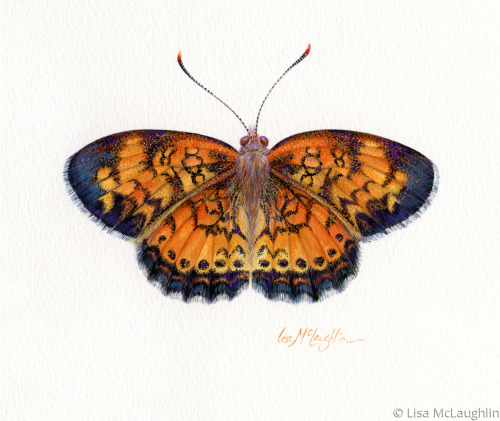 5" x 6.75"9" x 12"13" x 17.5"17" x 22.75"21" x 28.25"23.75" x 32"
in this unusual butterfly. 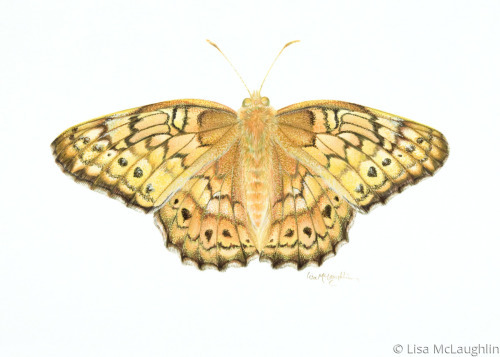 Variegated Fritillary Butterfly, life-like, delicate. 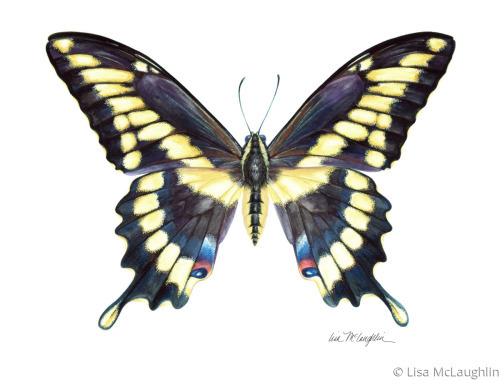 5" x 7"8" x 11.25"11" x 15.5"14" x 19.5"17" x 23.75"21.5" x 30.25"
Alfalfa sulfur Butterfly. 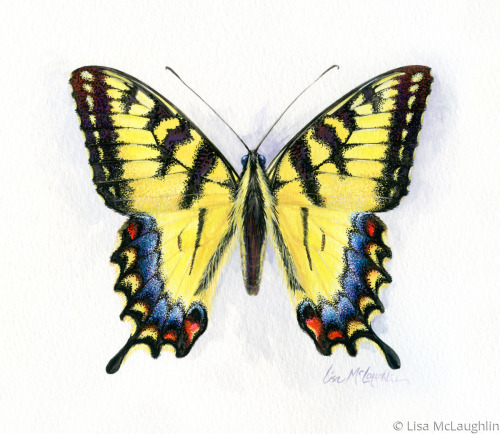 Bright, soft yellows, fine brush work, fine detail. 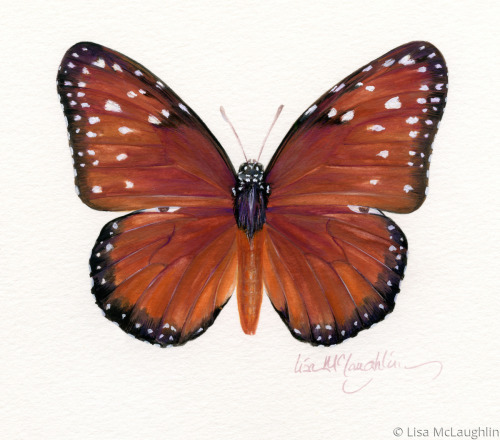 5" x 6.75"9" x 12"13" x 17.25"17" x 22.5"21" x 28"24" x 32"
on the wings of this little butterfly are reminiscent of Tiffany glass. 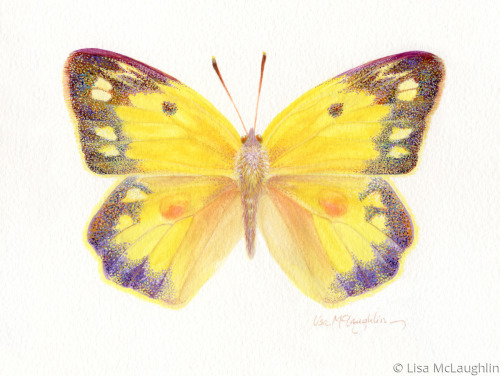 This popular yellow field butterfly would brighten any room! combines with lime shades. Whimsical yet realistic. Intricate patterns. 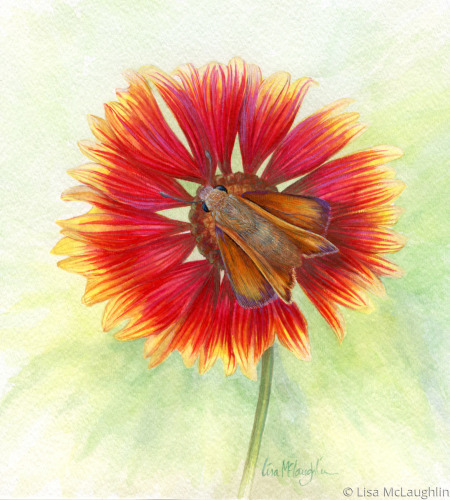 Little Black and orange field butterfly. Bright tangerine. 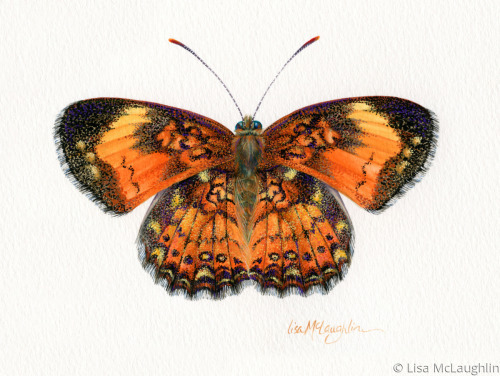 5" x 6"9" x 10.75"13" x 15.5"17" x 20.25"21" x 25"27.5" x 32.5"
Intricate patterns grace the wings of this black and orange butterfly. 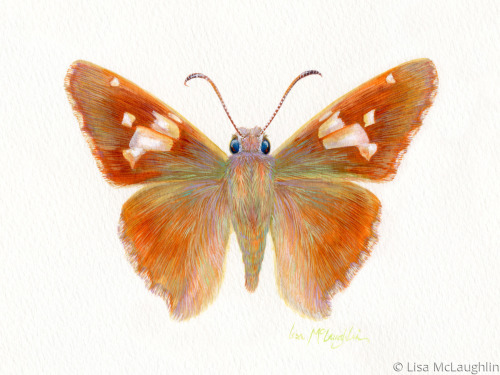 Delicate yet bold, this bright orange field butterfly really comes to life. 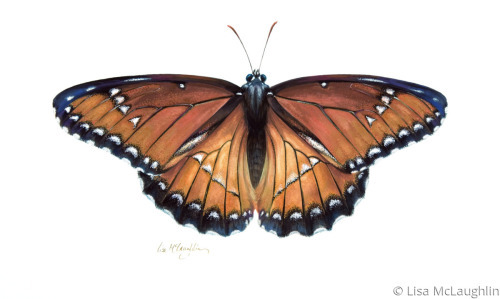 Viceroy Butterfly appears to be a Queen Butterfly. 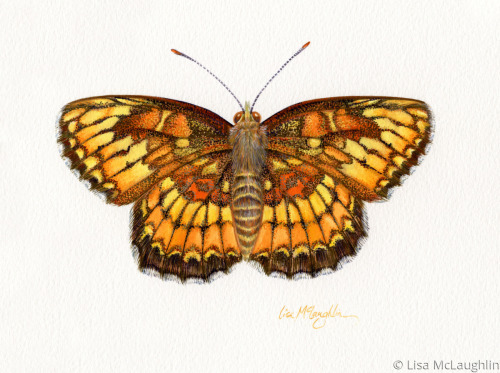 Popular southwestern butterfly painted in regional colors. 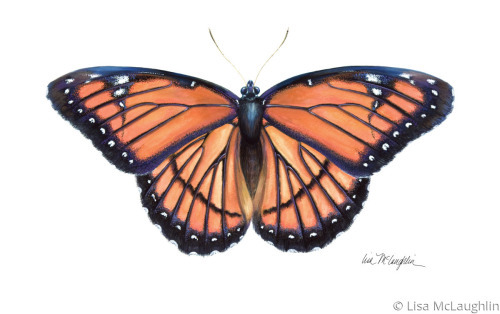 5" x 8.25"8" x 13.25"11" x 18.25"14" x 23.25"17" x 28.25"20" x 33.5"
Viceroy Butterfly appears to be a Monarch Butterfly. 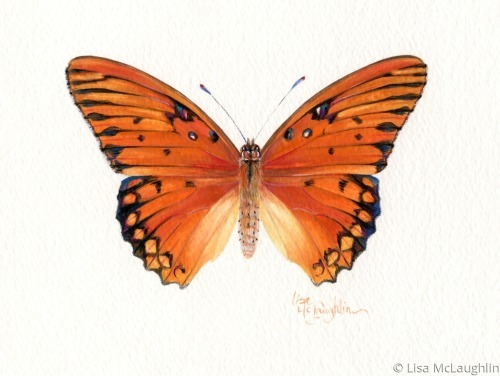 Rich tangerine and black, translucent wings of rich color. 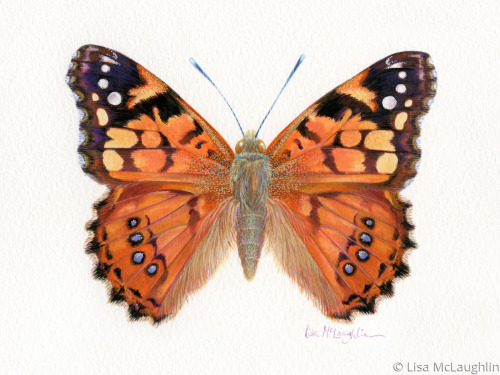 5" x 8"8" x 12.75"11" x 17.5"14" x 22.25"17" x 27"20" x 31.75"
Classic portrait of a Queen Butterfly, rich terra cotta wings. McLaughlin watercolor original is available for purchase, please contact. 5" x 5.75"9" x 10.25"13" x 14.75"17" x 19.25"21" x 24"22.75" x 26"
5" x 7.25"8" x 11.5"11" x 16"14" x 20.25"17" x 24.5"19.25" x 27.75"
Sara Orangetip Butterfly, white field butterfly with bright orange tipped wings. Spicebush Swallowtail Butterfly flies away from flower buds. 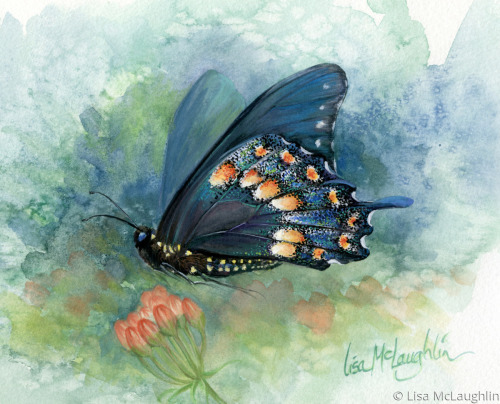 Splashes of watercolor. 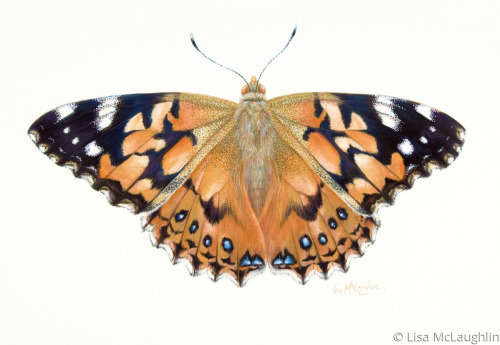 Detailed wings have a rich blue sheen. 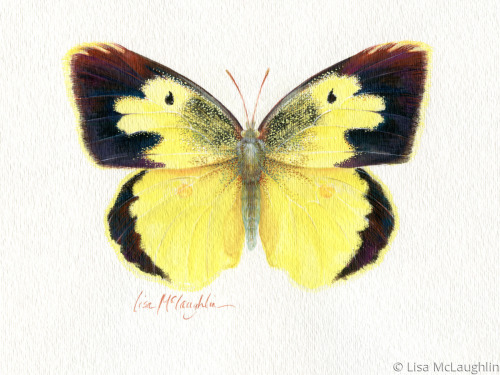 This original McLaughlin watercolor has been sold. 5" x 6.25"9" x 11.25"13" x 16"17" x 21"21" x 26"24.75" x 30.75"